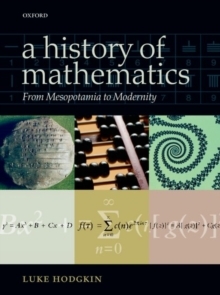 A History of Mathematics: From Mesopotamia to Modernity covers the evolution of mathematics through time and across the major Eastern and Western civilizations. It begins in Babylon, then describes the trials and tribulations of the Greek mathematicians. The important, and often neglected, influence of both Chinese and Islamic mathematics is covered in detail, placing the description of early Western mathematics in a global context. The book concludes withmodern mathematics, covering recent developments such as the advent of the computer, chaos theory, topology, mathematical physics, and the solution of Fermat's Last Theorem. Containing more than 100 illustrations and figures, this text, aimed at advanced undergraduates and postgraduates, addresses the methods and challenges associated with studying the history of mathematics. The reader is introduced to the leading figures in the history of mathematics (including Archimedes, Ptolemy, Qin Jiushao, al-Kashi, al-Khwarizmi, Galileo, Newton, Leibniz, Helmholtz, Hilbert, Alan Turing, and Andrew Wiles) and their fields. An extensive bibliography with cross-references tokey texts will provide invaluable resource to students and exercises (with solutions) will stretch the more advanced reader.